Did South Africa pay a World Cup bribe? 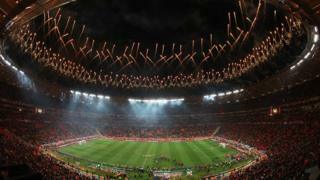 So did South Africa really pay a $10m (£6.5m) dollar bribe to make sure they won the right to host the 2010 World Cup? This is one of the several corruption allegations engulfing Fifa, whose president, Sepp Blatter, has just announced he will be resigning. If it was a bribe, it appears to have been a breathtakingly elegant, deniable one - performed both in broad daylight and years late. In recent days I have been talking, mostly off-the-record, to some senior figures here in South Africa - including one at the heart of the alleged corruption. As you would expect, the denials have come thick, fast and indignant. "Everything was above board. There is no story," said Roland Williams, a spokesman for Danny Jordaan, who led the 2004 team that bid for the tournament. South African officials have confirmed that $10m due to them from Fifa was, in effect, handed back to the football's world governing body with a note in 2008 that it should be given, instead, to the Diaspora Legacy Programme, to be "administered and implemented directly" by Jack Warner, president of Concacaf. "What he or anyone else in the Caribbean did with the money subsequently is nothing to do with us. Our hands are clean," said one source. Besides "that's just not how corruption works in Fifa - it's done pocket to pocket, in dark corners", said another well-placed official. If the idea that South Africa's government might willingly forgo $10m, in order to help the "African diaspora", sounds suspicious to some jaded ears, remember that, at that time, then-President Thabo Mbeki was a staunch proponent of exactly this sort of philosophy. South Africa's whole pitch for the tournament was based around the notion of 2010 being "Africa's World Cup" and in Mr Mbeki's eyes that was not just a geographical concept. Indeed a 2011 interview has emerged in which Mr Mbeki, said that "by African we don't just mean... the continent, but we also mean the African diaspora. "As a result of that it was then agreed that... funds that would be made available for the hosting of the World Cup in South Africa... other funds would also be made available in Trinidad and Tobago to develop soccer in the Caribbean." Does that mean South Africa is off the hook? We still know nothing, for starters, about the earlier Paris hotel room incident where, the FBI alleges, tens of thousands of dollars were handed over in a suitcase by a South African official to someone representing Mr Warner, who has denied all the US allegations. We may learn a little more at a news conference on Wednesday in Johannesburg hosted by the Minister of Sports Fikile Mbalula. One of his aides described it as an opportunity for the media "to drop your bombs on us". In the meantime, a few other questions spring to mind. Why has South Africa's Football Association (Safa) taken such pains to insist that "neither the [Fifa] Secretary General Jerome Valcke nor any other member of Fifa's senior management were involved in the initiation, approval and implementation of the Diaspora project," when a letter from Safa dated 2008 regarding the $10m donation is clearly addressed to Mr Valcke himself? A minor bureaucratic detail or an attempt to protect someone senior? Mr Valcke, who denies any involvement in the scandal, is not under indictment and prosecutors have not accused him of wrongdoing. When will we learn the identities of the FBI's South African co-conspirators #15 and #16? What evidence - beyond the allegations of co-conspirator #1 who "understood the offer" to be a bribe - does the FBI have to show the South African government intended the $10m gift to be a corrupt payment to Mr Warner? If you have other questions for South Africa's minister of sport, please tweet them to me @BBCAndrewH.